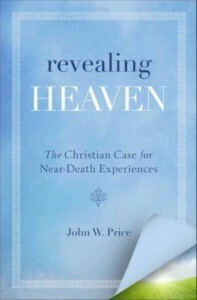 In Revealing Heaven, Reverend John W. Price makes the case for how near-death experiences can be gifts from God and are fully compatible with Christian spirituality and the Bible. As a pastor open to near-death experiences, he has heard more than 200 personal accounts of this phenomena. Todd Burpo's bestelling book Heaven Is for Real, the story of a young child’s near-death experience, has validated the existence of heaven and of God for many. Yet there are Christians who remain uncomfortable with the idea of near-death experiences; they wonder if these events are in line with the Bible and Christian teaching. In Revealing Heaven: The Christian Case for Near-Death Experiences, Reverend Price shares compelling testimonies that prove that Christians can not only trust near-death experiences as valid and consistent with Biblical teaching, but he demonstrates how they can help us understand death, grief, and what happens after this life is over, and provides ample reasons for us to be open to these amazing stories and to hope for what we’ve always dreamed about. I came to this book through reading reviews from other bloggers, reviews that were decidedly mixed. As I read more reviews, I realized that they fell into two groups. On the one hand, there were the people who liked the book. On the other, there were people who were upset because Price questioned their view of Christianity. According to Price, non-Christians, animals, and (gasp!) homosexuals go to heaven and there were a lot of people who were not happy in the least about that. I'll admit it--I wanted to see what the hubbub was about. Before I go further, I think I should state where I stand on death, Heaven, Near Death Experiences (NDE's), and the like. In short, I believe in it all. I am a devout Christian and I believe that there is everlasting life. However, I also believe that, as mortals, none of us are even remotely able to understand God and his ways. To hold Him strictly to our interpretation of the Bible is arrogant and wrong. Nor do I have any patience for those who use God's word to support their views, rather than letting God's word form their views. Who are we to question who gets into heaven and who does not? So, when Price's research leads to possibility that it is not just the chosen few who get into heaven, not only am I fine with that, I'm relieved. Okay, that is out of the way and what I think of the people who decried this book as being "wrong." But what did I think of the book? Frankly, I wasn't overly impressed. This really doesn't have anything to do with the content--as I said, Price was preaching to the choir with me on this one. However, this was not a successful book for me. While I'm all on board with the content of this book, the writing lost me. Price is a rather clunky writer, which made this hard to read at times. I also felt that he needed to spend more time editing to streamline his work. He gives many examples of NDE's throughout his book, but he doesn't do so in a way that differentiates one from another. Then he refers back to them by the subject's name and I wasn't able to keep all the information straight. My other major complaint with this book is Price's ego. He spends a lot of time talking about he turned around a congregation and about how he improved things. There is even one NDE he reports where Jesus--yes, Jesus!--tells a woman that he--John Price--is right and she should listen to him. I mean, yeah, that could have happened. But there is just something about going around saying that Jesus says you are right that makes me doubt the messenger a bit. So, there you go. If you are looking for information about NDE's, it is here in this book. However, you will have to look through the writing--and the author--to get to the information. I was not solicited for this review and received no compensation. It would be hard for me to read a book all the way through if I wasn't into it... go you for finishing it and writing a thorough review! Unfortunately, it is very hard for me not to finish a book. I'm trying to "give myself permission" to do so. The only reason I kept going with this one is that I found the subject matter interesting.